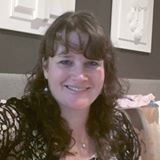 I first met Jennifer Lees-Marshment over ten years ago when she was based in the UK but was working on Political Marketing and Political Science projects as a visiting fellow at ANU and presented some of her findings at seminars in the Australian Federal Parliament. We joked after one of her seminars about the defensive critiques she was receiving from some of the “practitioners” in the room. I won’t name names but needless to say our shared frustration with the overt cynicism many practitioners have for political scientists helped break the ice. Jennifer is an international leader in political marketing which explores how politicians and government use tools like branding and market research to win and retain power. Last year she pioneered the development of a new Stage Three course at Auckland “The Practice of Politics” (the only of its kind in New Zealand), which teaches students about the diversity of career options in politics and the challenges they may face. 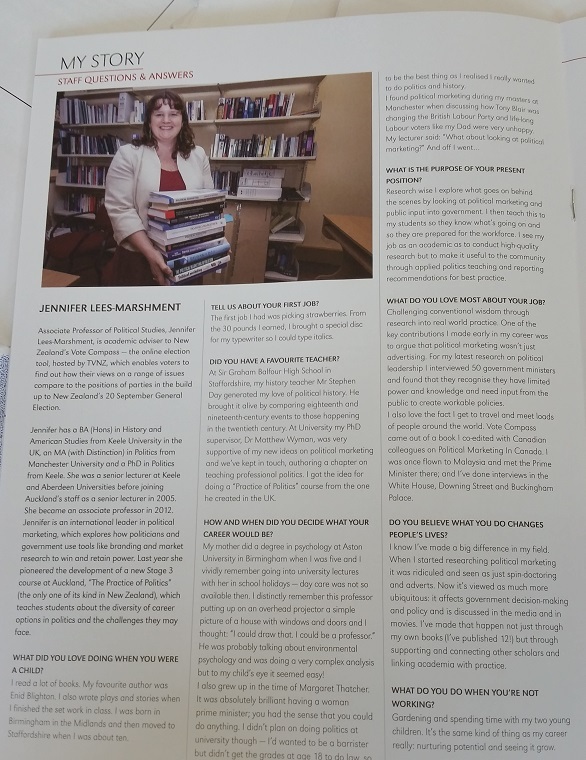 Jennifer has a BA (Hons) in History and American Studies from Keele University in the UK, an MA (with Distinction) in Politics from Manchester and a PhD in Politics from Keele. She was a senior lecturer at Keele and Aberdeen universities before joining Auckland’s staff as a senior lecturer in 2005. She became an associate professor in 2012. Associate Professor of Political Studies Jennifer Lees-Marshment is academic adviser to New Zealand’s Vote Compass – the online election tool, hosted by TVNZ, which enables voters to find out how their views on a range of issues compare to the positions of parties in the build up to New Zealand’s 20 September General Election. Her research and writing broadened the scope of political marketing from campaigning to behaviour and from elections to governing and has been widely cited and influential with review comments including ‘an enormous contribution’; ‘a must-have-on-your-shelf volume’; ‘authoritative and accessible’; ‘sophisticated, learned research’; ‘an important and innovative book’; ‘sagacious views’; ‘a wealth of insights’; ‘a hugely informative study on an important field’; ‘ground breaking’; ‘a timely and extremely important book’; ‘a valuable addition.’; ‘pioneering collection’; ‘a significant contribution.’ She has authored/edited 13 books and reviews have noted the practical advice within them: ‘crucial to our understanding of how this world works — not just in theory, but in practice’; ‘all those who claim to understand modern political strategy, all those pundits and government-relations experts we see on TV, should keep this volume at hand as an essential reference’; ‘this book will be a bible for political operatives to be kept close at hand for frequent reference.’ She has also interviewed over 200 political elites and involved practitioners in events and publications throughout her career. Her newest book is The Ministry of Public Input to be published in January 2015. In July this year Associate Professor Marshment made a brilliant presentation to the 2014 Campaign Management and Political Marketing Workshop held at Sydney University in July (and I will eventually write a separate post about her presentation and a few others when I find some more spare time). In the meantime, your best understanding about her work will be derived from purchasing her latest book: Political Marketing Principles and Applications which is well worth the investment for the interview-derived case studies alone. So tell me about yourself. Who are you in a nutshell? I am a gardener academic – I like to break new ground and nurture new ideas and people to grow into the tallest of trees people came climb and get a different view from. I produce ground breaking research that aims to change the way people think – early in my career I argued that political marketing wasn’t just about selling or campaigning; I am now arguing for new views on political leaders and public input in government. I also want to take university out of the ivory tower and connect it with the real world through research led but practice oriented teaching. As a nurturing leader, I look for ways to support new ideas, new scholars, new studnets all the time, and work across the usual hierarchies of power, discipline and geographical boundaries. Of course, doing all of this puts me up against some pretty big brick walls – being a leader, who seek leadership as about supporting others not just promulgating your own ideas and power, and thinks academics are there to serve society not just create knowledge for knowledge sake is “disruptive thinking” for most institutions, and goes against the grain of traditional culture. But when I look back on my career I have achieved so much in terms of changing views of political marketing, connecting and supporting people I remain proud of this wonderful – if challenging – path I choose to take. Where do you live/work/study/teach? I work at the University of Auckland in New Zealand and teach Political Marketing, Political Management in Government and The Practice of Politics. What compels you to write and research politics? A fundamental passion to write about what is really going on in politics, uncover things people do not normally see, communicate those new findings, generate debate about them, and use them to inform better practice through teaching and professional training. For example I have helped to show that political marketing is happening throughout the world not just in campaign time and involves a whole range of marketing tools and concepts. And more recently with my work The Ministry of Public Input I found that politicians are integrating a range of public input into their decision making and being reflective and deliberative. We don’t see that from the outside so I think it’s important academics find it out and let everyone know. Whilst I think academia needs to connect with the outside world, I still believe in the value of traditional critical objective research, but I just then go one step further in trying to take that research to the real world. It’s not so much changing what we do as changing what we do with it. What do you love about politics? Ultimately it’s about how to make life better for everyone. My real underlying passion is how can we get politicians to be more responsive to the public and provide them with – or work with them to create – a better life. It appeals to my sense of what democracy is all about. And I love trying to understand it, seeing my theories proven right – and learning all over again when they might be found to be wrong or need updating! Is there anything you don’t like about modern politics? The cynicism towards politicians. As employers of politicians we do not manage them well. All we do is see their bad points; we fail to see how hard they work, how reasonable most of them really are; and how they are just doing their best to create a better society. I’ve presented my research on political leaders recently and been really taken by the huge negativity that comes towards you when you suggest – on the basis of research – that politicians might actually act and think in a way that is positive. People don’t want to hear it; they much prefer to think badly of politicians. That isn’t good for democracy. Who are your favourite writers? I like any story about someone triumphing over obstacles. No particular favourite authors. What are your favourite websites and news sources? The NZ Herald as it has a free app that is easy to use. For the NZ election I am recording the one news by TVNZ so I keep up to date with it all but normally I wouldn’t as it’s kid dinner bath bedtime. What’s the first thing you do each morning? Feel tired. I don’t get enough sleep/rest. What is your one recommended must-read for aspiring psephologists? Well you invited the plug so I would say The Political Marketing Game as it gives a great overview of what political marketing is all about and has material from interviews with 100 practitioners in it, not just academic theory. Either that or the textbook introducing the field – Political Marketing: Principles and Applications 2nd edition. Or Shopping for Votes by Canadian journalist Susan Delacourt which is an easy but informed and objective read into the use of marketing in Canadian politics. What’s your favourite political movie/book/documentary/TV series? Commander in Chief was good. I liked Scandal and House of Cards but they get a bit far fetched/too much about stuff that isn’t politics after a while. Then there is Dave the Chameleon done by UK Labour against David Cameron which illustrates some of the problems with over marketing politicians – http://www.youtube.com/watch?v=bRKhTQHrtdk. What are you currently reading or working on? Nothing! Well, not a publication anyway – I am doing Vote Compass for the 2014 New Zealand election; and distributing a report from The Ministry of Public Input to government staff to get the idea of creating an all of government unit to collect, analyse and communicate public input going round government. And trying to get a book series in political marketing underway. So then again, quite a lot…but having completed 3 books in the last two years and having no new book to write as yet it feels like a lot less work. Which other psephologists do you recommend I interview soon? Andre Turcotte at Carleton University in Canada. He’s a political marketer who runs a course on political management but also carries out market research so he would definitely be good. Jennifer recently gave an interview to a University publication about her life, her work and interests. below is a photo of the published interview, with a transcript further below. What did you love doing when you were a child? I read a lot of books. My favourite author was Enid Blighton. I also wrote plays and stories when I finished the set work in class. I was born in Birmingham in the Midlands and then moved to Staffordshire when I was about 10. Tell us about your first job? The first job I had was picking strawberries. From the 30 pounds I earned, I brought a special disc for my typewriter so I could type italics. Did you have a favourite teacher? At Sir Graham Balfour High school in Staffordshire, my history teacher Mr Stephen Day generated my love of political history. He brought it alive by comparing 18/19th century events to those happening in the 20th. At University my PhD supervisor, Dr Matthew Wyman was very supportive of my new ideas on political marketing and we’ve kept in touch, authoring a chapter on teaching professional politics. I got the idea for doing a Practice of Politics course from the one he created in the UK. How and when did you decide what your career would be? My mother did a degree in psychology at Aston University in Birmingham when I was five and I vividly remember going into university lectures with her in school holidays – daycare was not so available then. I distinctly remember this professor putting up on an overhead projector a simple picture of a house with windows and doors and I thought: “I could draw that. I could be a professor.” He was probably talking about environmental psychology and was doing a very complex analysis but to my child’s eye it seemed easy! I also grew up in the time of Margaret Thatcher. It was absolutely brilliant having a woman prime minister; you had the sense that you could do anything. What is the purpose of your present position Research wise I explore what goes on behind the scenes by looking at political marketing and public input into government. I then teach this to my students so they know what’s going on and so they are prepared for the workforce. I see my job as an academic as to conduct high-quality research but to make it useful to the community through applied politics teaching and reporting recommendations for best practice. What do you love most about your job Challenging conventional wisdom through research into real world practice. One of the key contributions I made early in my career was to argue that political marketing wasn’t just advertising. For my latest research on political leadership I interviewed 50 government ministers and found that they recognise they have limited power and knowledge and need input from the public to create workable policies. I also love the fact I get to travel and meet loads of people around the world. Vote Compass came out of a book I co-edited with Canadian colleagues on Political Marketing In Canada. I was once flown to Malaysia and met the Prime Minister there; and I‘ve done interviews in the White House, Downing Street and Buckingham Palace. Do you believe what you do changes people’s lives I know I’ve made a big difference in my field. When I started researching political marketing it was ridiculed and seen as just spin-doctoring and adverts. Now it’s viewed as much more ubiquitous: it affects government decision-making and policy and is discussed in the media and in movies. I’ve made that happen not just through my own books (I’ve published 12!) but through supporting and connecting other scholars and linking academia with practice. What do you do when you’re not working Gardening and my two young children. It’s the same kind of thing as my career really: nurturing potential and seeing it grow. This entry was posted in Meet an election specialist and tagged elections, Jennifer, lees-marshment, marketing, political, politics, scientist, university. As mentioned previously, I’m not alone in thinking about how professional Australian politics has becomes over the past few decades. For several years since I started a thesis, which is now on a back-burner due to work, family, life, etc. Then around October last year at a media conference in ANU I heard that Greg Jericho was heading up the new “Political Communications” degree training at UC – great stuff! The Campaigns & Communications Manager (CCM) would suit a highly motivated person with a strong history in managing large-scale campaigns in a political environment, and who possesses highly developed strategic and communications skills. As part of a small team the CCM will be responsible for the overall management of the Senator’s re-election campaign along with management of strategic communications and campaign priorities of the Senator’s various portfolios. The CCM will work closely with the Senator’s Chief of Staff and Media Advisor to ensure day-to-day communications are strategic and effective. The CCM will also work with the Senator’s Electorate Liaison officer on campaign priorities and election preparations. 1. Primary responsibility for coordinating the Senator’s re-election campaign. 2. Develop and manage the Senator’s communication strategy. 3. Work with Media Advisor to ensure all communications are clear, effective and strategic. 5. Develop and support key campaigns on key portfolio priorities. 6. Work closely with internal and external stakeholders to ensure consistency and co-ordination of the Senator’s strategic direction, communications and campaign priorities. 7. Identify campaigning opportunities that support parliamentary work and parliamentary opportunities that will support ongoing campaigns. 8. Help manage and coordinate Senator’s media appearances and requests as required. 9. Manage the production of communication materials produced and authorised by the Senator’s office. 10. Represent the Senator on internal election campaign committees and working groups. 11. Represent the Senator at official events, party functions, community meetings and public engagements if required. A salary within the range $60,827 -69,216pa will be determined commensurate with relevant skills and experience. In addition, an allowance in the range $14,319-$17,898 is payable in lieu of overtime. This entry was posted in Campaign Techniques, Political Science and tagged campaign, communications, marketing, politics, professionalisation, science. If you’ve read my earlier (now slightly dated) literature review or discussed political campaigning with me over a few beers (I apologise for everything I said after the third beer) you’ll know I often lament about the relative lack of professional and academic interest in political campaign training in Australia. Well it’s clear I’m not the only one, because this week in Sydney there’ll be an inaugural event that brings many academics and practitioners together to discuss this very thing! 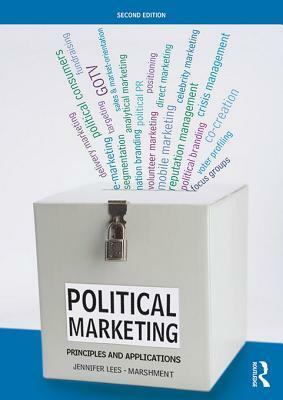 Check out the website: http://www.cmpm2014.org/ for “The 2014 Australia New Zealand WORKSHOP ON CAMPAIGN MANAGEMENT & POLITICAL MARKETING”. As far as I know registration is open to all those with an interest in this field, academic or otherwise. Political polling, door-knocking, the targeting of marginal seats and swinging voters. They’re terms all Australians are now very familiar with as elections continually roll around. But that wasn’t always the case. Academic and author Stephen Mills examines how politics in Australia has been shaped and influenced in the newly published The Professionals: Strategy, Money and the Rise of the Political Campaigner in Australia. 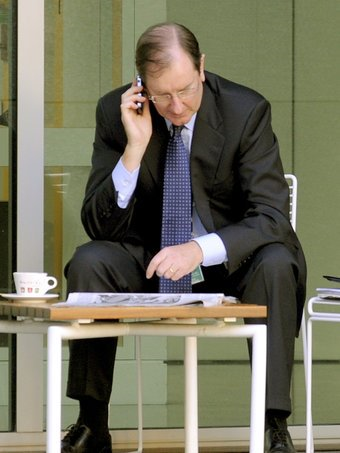 That’s not Stephen, it’s Liberal Party National Director Mr Brian Loughnane, one of the many interviewees featured in Stephen’s new book. Do yourself a favour and buy it. This entry was posted in Campaign History, Campaign Techniques, Political Science and tagged Australia, campaign, elections, management, marketing, political, political campaigning, science, Stephen Mills.